The Greater Rhea, Rhea americana, is a flightless bird found in eastern South America. Other names for the Greater Rhea include the Grey, Common, American Rhea, ñandú (Spanish) or ema (Portuguese). One of two species in the genus Rhea, in the family Rheidae, the Greater Rhea is endemic to Argentina, Bolivia, Brazil, Paraguay, and Uruguay. It inhabits a variety of open areas, such as grasslands, savanna or grassy wetlands. 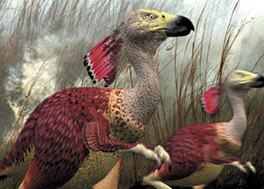 It has a length of 3–5 feet (0.91–1.5 m) and a wingspan of 5 feet (1.5 m). Weighing 50–55 pounds (23–25 kg), the Greater Rhea is the largest bird in South America. In the wild, the Greater Rhea has a life expectancy of 15 years. It is also notable for its reproductive habits, and for the fact that a group has established itself in Germany in recent years. The Greater Rhea derives its scientific name from Rhea, a Greek goddess, and the Latinized form of America. It was originally described by Carolus Linnaeus in his 18th-century work, Systema Naturae under its current binomial name. He identified specimens from Sergipe, and Rio Grande do Norte, Brazil, in 1758. They are from the family Rheidae, and the order Struthioniformes, commonly known as ratites. They are joined in this order by Emus, Ostriches, cassowaries, and kiwis, along with the extinct forms moas, and elephant birds. The adults have an average weight of 20–27 kg (44–60 lb) and measure 129 cm (51 in) long from beak to tail; they usually stand about 1.50 m (4.9 ft) tall. The males are generally bigger than the females. Large males can weigh up to 40 kilograms (88 lb), stand nearly 1.83 m (6.0 ft) tall and measure over 150 cm (59 in) long. The legs are long and strong, and have three toes. The wings of the American rhea are rather long; the birds use them during running to maintain balance during tight turns. Greater Rheas have a fluffy, tattered-looking plumage. The feathers are gray or brown, with high individual variation, In general, males are darker than females. Even in the wild—particularly in Argentina—leucistic individuals (with white body plumage and blue eyes) as well as albinos occur. Hatchling Greater Rheas are grey with dark lengthwise stripes. The Greater Rhea is endemic to Argentina, Bolivia, Brazil, Paraguay, and Uruguay. This species inhabits grassland dominated by satintail (Imperata) and bahiagrass (Paspalum) species, as well as savanna, scrub forest, chaparral, and even desert and palustrine lands, though it prefers areas with at least some tall vegetation. It is absent from the humid tropical forests of the Mata Atlântica and planalto uplands along the coast of Brazil and extends south to 40° latitude. During the breeding season (spring and summer), it stays near water. A small population of the Greater Rhea has become established in Germany. Three pairs escaped from a farm in Gross Grönau, Schleswig-Holstein, in August 2000. These birds survived the winter and succeeded in breeding in a habitat sufficiently similar to their native South American range. They eventually crossed the Wakenitz river and settled in Mecklenburg-Vorpommern in the area around and particularly to the north of Thandorf village. As of late 2000 the population was estimated to be seven birds and in 2001 eighteen birds. In October 2008 the population was estimated by two German scientists at around 100 birds (Korthals, A. & F. Philipp). These rheas are legally protected in Germany in a similar way to native species. In its new home, the Greater Rhea is considered generally beneficial as its browsing helps maintain the habitat diversity of the sparsely populated grasslands bordering the Schaalsee biosphere reserve. The bulk of its food consists of broad-leaved dicot foliage and other plantstuffs, particularly seed and fruit when in season. Favorite food plants include native and introduced species from all sorts of dicot families, such as Amaranthaceae, Asteraceae, Bignoniaceae, Brassicaceae, Fabaceae, Lamiaceae, Myrtaceae or Solanaceae. Magnoliidae fruit, for example of Duguetia furfuracea (Annonaceae) or avocados (Persea americana, Lauraceae) can be seasonally important. They do not usually eat cereal grains, or monocots in general. However, the leaves of particular grass species like Brachiaria brizantha can be eaten in large quantities, and Liliaceae (e.g. the sarsaparilla Smilax brasiliensis) have also been recorded as foodplants. Even tough and spiny vegetable matter like tubers or thistles is eaten with relish. Like many birds which feed on tough plant matter, the Greater Rhea swallows pebbles which help grind down the food for easy digestion. It is much attracted to sparkling objects and sometimes accidentally swallows metallic or glossy objects. In fields and plantations of plants they do not like to eat, e.g., cereals or eucalyptus, the Greater Rhea can be a species quite beneficial to farmers. It will eat any large invertebrate it can catch; its food includes locusts and grasshoppers, true bugs, cockroaches, and other pest insects. Juveniles eat more animal matter than adults. In mixed cerrado and agricultural land in Minas Gerais (Brazil), R. a. americana was noted to be particularly fond of beetles. It is not clear whether this applies to the species in general but for example in pampas habitat, beetle consumption is probably lower simply due to availability while Orthoptera might be more important. The Greater Rhea is able to eat Hymenoptera in quantity. These insects contain among them many who can give painful stings, though the birds do not seem to mind. It may be that this species has elevated resistance to poison, as it readily eats scorpions. But even small vertebrates like rodents, snakes, lizards, and small birds are eaten. Sometimes, Greater Rheas will gather at carrion to feed on flies; they are also known to eat dead or dying fish in the dry season, but as vertebrate prey in general not in large quantities. Captive-bred Greater Rheas exhibit significant ecological naïvete. This fearlessness renders them highly vulnerable to predators if the birds are released into the wild in reintroduction projects. Classical conditioning of Greater Rhea juveniles against predator models can prevent this to some degree, but the personality type of the birds—whether they are bold or shy—influences the success of such training. In 2006, a protocol was established for training Greater Rheas to avoid would-be predators, and for identifying the most cautious animals for release. Greater Rheas breed in the warmer months, between August and January depending on the climate. Males are simultaneously polygynous, females are serially polyandrous. In practice, this means that the females move around during breeding season, mating with a male and depositing their eggs with the male before leaving him and mating with another male. Males on the other hand are sedentary, attending the nests and taking care of incubation and the hatchlings all on their own. Although recent evidence suggest that dominant males may enlist a subordinate male to roost for him while he starts a second nest with a second harem. The nests are thus collectively used by several females and can contain as many as 80 eggs laid by a dozen females; each individual female's clutch numbers some 5–10 eggs. However, the average clutch size is 26 with 7 different females eggs. Rhea eggs measure about 130 × 90 mm (5.1 × 3.5 in) and weigh 600 g (21 oz) on average; they are thus less than half the size of an ostrich egg. Their shell is greenish-yellow when fresh but soon fades to dull cream when exposed to light. The nest is a simple shallow and wide scrape in a hidden location; males will drag sticks, grass, and leaves in the area surrounding the nest so it resembles a firebreak as wide as their neck can reach. The incubation period is 29–43 days. All the eggs hatch within 36 hours of each other even though the eggs in one nest were laid perhaps as much as two weeks apart. As it seems, when the first young are ready to hatch they start a call resembling a pop-bottle rocket, even while still inside the egg, thus the hatching time is coordinated. Greater Rheas are half-grown about three months after hatching, and sexually mature by their 14th month. The Greater Rhea is considered a Near Threatened species according to the IUCN. The species is believed to be declining due to increased hunting and the conversion of central South American grasslands to farmland. The populations of Argentina and Uruguay are most seriously affected by the decline. Farmers sometimes consider the Greater Rhea pests, because they will eat broad-leaved crop plants, such as cabbage, chard and bok choi. Where they occur as pests, farmers tend to hunt and kill Greater Rheas. The burning of crops in South America has also contributed to their decline.